Each year as November 1 approaches, I think, "It can't be as fine as I remember," and each year it is finer. On this night, The Living Arts and Science Center and Christ Church Cathedral welcome many artists, including student groups, to light up the mid-1800s Old Episcopal Burying Ground behind my downtown house. 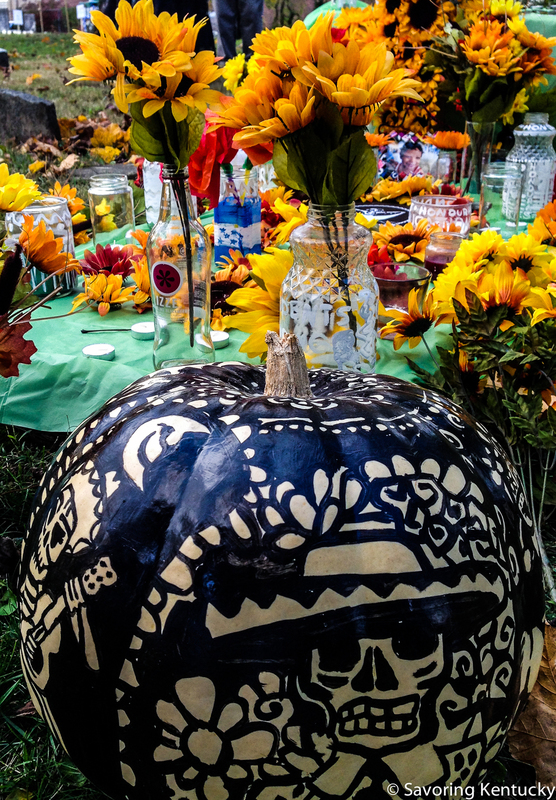 Art, food, music, memory, love, death and life—all the ineffables that defy language—find expression on this one night, the Day of the Dead celebration, as we invite our loved ones who have gone on to join us in a feast of connection and remembrance. I don't know how to capture the full-on night-time experience, the candles and torches everywhere lighting up beautiful altars, the soundtrack of awed conversation, pulsing percussion and dancing. But I took a few pictures as evening came this year. Gratitude to the ancestors from other cultures, most recently Mexico, who inspire and inform the Day of the Dead. Gratitude to all the sponsors and artists whose imaginations and hard work illuminate the border between life and death. You free us, once a year, from fear and unthinking assumptions. The experience affirms life, in all its mystery.